In 2013, I graduated from Bath Spa University with an MA in Writing for Young People. That was the kick-start. Stone Rider was published in 2015. What was the inspiration behind Stone Rider? The idea was born in a workshop with the world’s greatest writing coach, Steve Voake. I submitted a piece that turned out to be the opening scene. Crossing an alien desert came a group of riders, like horsemen of the apocalypse. Only here, instead of horses, they were riding other-worldly bykes. I knew I wanted fear and adrenalin, dust and blood and vengeance. A primal story. I suppose it sprang from the Westerns I loved as a kid. The Dollars Trilogy. Pale Rider. Once Upon a Time in the West. But also something futuristic. Alien. Mad Max. Blade Runner. Star Wars. What was your favourite book as a teenager, and which YA writers do you admire today? Stephen King was a favourite in my early teens. In particular, The Bachman Books. I loved the darkness and the cool originality of his worlds. The short story, The Long Walk, has definite parallels with Stone Rider. I remember the feeling of the story. It stayed with me. I admire so many YA authors today. Patrick Ness is a genius. Matt Haig writes with such humanity and wit and warmth. Nobody gets teenage angst better than John Green. My friend, Clare Furniss, knows how to move you from tears to laughter in a heartbeat. Tim Winton’s book, Breath, is exquisite. Everything he writes is beautiful. Where and when do you do your writing? I’d like to be one of those writers who wake up at six every morning, write for a fluid four-hour stretch, break for casual meandering and bullfighting, then another two hours in the afternoon and a further two editing in the evening. I read somewhere this is the optimal way to write. Clearly I am suboptimal. I work four days a week in Advertising, so I tend to write when I can. In the evenings and late at night. But I dream about my stories all the time and jot down scenes on the Tube, the train or even at work during mindless conference calls. Don’t tell my boss. The Grand Prix de l’Imaginaire (GPI) is the oldest French SFF award still active – since 1974 – as well as the most prestigious devoted to “Literature of the Imagination”. The term 'imaginaire' (imaginary) covers all 'pulp fictional types' such as science fiction, fantasy, horror as well as various mergers or 'transfictions'. This prize is linked to the Salon du Livre de Jeunesse de Montreuil – the annual children’s book event in France. Normally literary Prizes in France exclude non-native authors but this year the Pépites (Gems) have introduced the ‘European Novel Prize’ category, which allows translated fiction to have a chance. 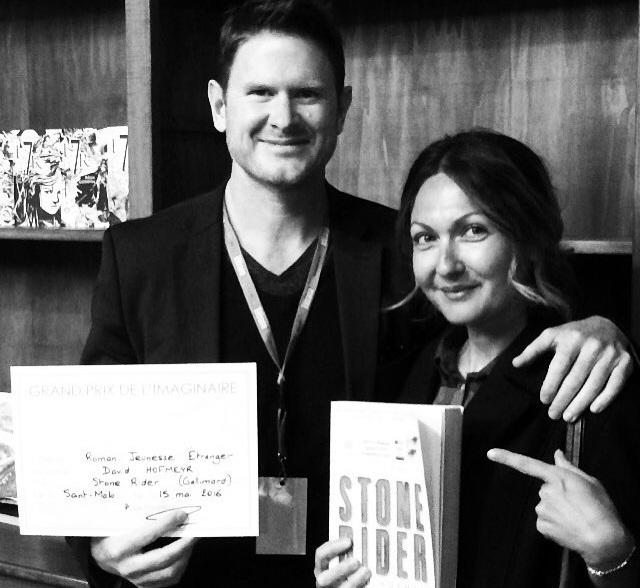 Stone Rider is translated from English by Alice Marchand (Gallimard Jeunesse).